"With Final Stand, we knew from the start that we wanted to evolve the Battlefield experience and offer weapons and vehicles that behave differently than anything else on the battlefield," DICE said today. "Taking place on the arctic landscape of Russia, where the scientists of today are experimenting with technology that will define the battlefields of tomorrow (Battlefield 2142, anyone? ), Final Stand will deliver four maps that are unique and distinct." The trailer shows off each of the four maps. "Operation Whiteout" is set in and around a military base in the midst of a blizzard. "Hammerhead" lets players fight for control of a lakeside base or take the battle up into the neighboring mountains. "Giants of Karelia" brings the action to a mech installation in a slightly warmer climate. The fourth and final map is "Hangar 21," an enormous airbase carved into the side of a mountain. DICE says we can expect "intense, infantry-focused combat" from these maps, presumably inside the secretive military bases in each. None of the maps look like Operation Locker, though; they've got plenty of surrounding wilderness for larger-scale modes like Conquest or Obliteration. Players will find experimental weapons and vehicles while exploring these locations. One example DICE provided today is a rail gun, which fires one round of kinetic energy. The hover tank, meanwhile, combines agility with heavy firepower. "We have a few more surprises up our sleeves that we’ll share with you in the weeks ahead," DICE says. The developers want players to provide some early feedback on Final Stand maps. Starting today the community can try out the DLC through the Community Test Environment. One of the four maps will be available per day. Only a limited number of slots will be available, though, so you might not get in. Also, you need to be a Battlefield 4 Premium owner on PC in order to access the Community Test Environment. If that describes you, you can head here to get started. 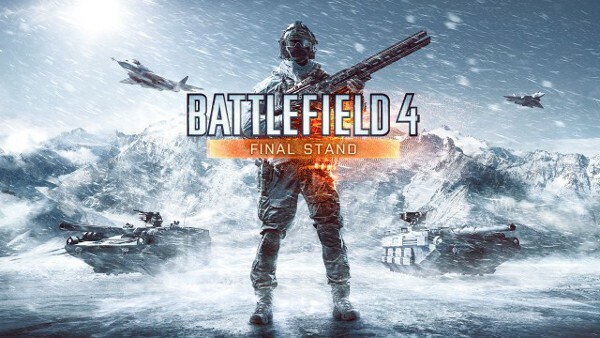 DICE didn't mention when Final Stand will be released. However, they mention in the announcement that they're going to release additional information "in the weeks ahead." There's a good chance we won't see this expansion until October at the earliest, then.